I really enjoyed The Goddess Test. So I was super excited to read Goddess Interrupted, and I have to say it did not disappoint! In fact I even think that I might have liked Goddess Interrupted even more than The Goddess Test, which is a huge deal. So obviously Aimee Carter does not fall to the dreaded lame second book curse. Though one of the problems I had with the first book was still annoying in Goddess Interrupted. I still wish we had gotten to know Henry more. I know that we learned a little but since he was mostly gone in this book we still don't know him very well. But there is an excerpt at the end from Henry's point of view which gave me a better understanding of who he is. In Goddess Interrupted we got to meet Persephone, as well as getting to explore the Underworld. I loved learning more about the Underworld and how it worked and I hope we can get even more f that in the next book. Persephone while starting out annoying and vapid, became a sympathetic character and I really like how Aimee Carter was able to do that. I think Kate starting coming into her own and finding out her place in the Underworld. And then she was slammed with conflict. I was genuinely surprised by the twist at the end and I cannot wait for the next book. I could not put Goddess Interrupted down. I had to know what was going to happen. I think ti would be a great summer read because its not too long but its full of tension. I definitely recommend that you run and pick this up! 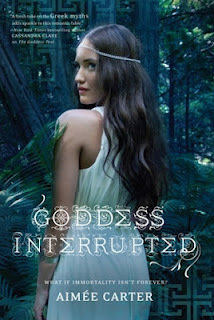 I also have a copy of Goddess Interrupted up for grabs! I haven't read it, yet. I haven't read it yet but it sounds like both books are enjoyable. The world-building appeals to me the most. I loved that the tests were based on the seven deadly sins!